Good Morning from Miami! After delayed flights…and cancelled flights…and rebooking out of a completely DIFFERENT airport, I have finally arrived. How wonderful it is to see the sun…and feel it’s warmth! As I mentioned in my last post, I am travelling again for work. This weekend, Florida! I have been to Miami several times now, but planning dinners never gets old! Of particular interest, I have reservations at Prime 112 (one of my favorites) and Bin 18. I will be sure to share my reviews! Before flying out of Moline, IL last night, I made a stop at one of my all-time favorite sandwich joints, The Village Corner Deli in East Davenport, IA. I was introduced to this hidden gem by Julie Edmunds more than 3 years ago and it remains a “must-stop” when I visit the Quad Cities. Thank you, Julie! For those of you who dine with me often, you know that I can be a creature of habit. When I find something I like, it is hard for me to order something different. I mean, come on, what if it just isn’t as good as my “restaurant favorite”?! For example, each and every time I walk into Her Soup Kitchen, Barb smiles and says, “Roasted Portabella Sandwich? !”….Yes Ma’am! Lunch/dinner at the Corner Deli is no different. When Julie first took me in for lunch, I asked her order for me (I figured she knew what was best!). In my basket arrived a Smoked Turkery Pesto Sandwich. I LOVED it. And so…I order it every time. What can I say? It is one dang good sandwich. 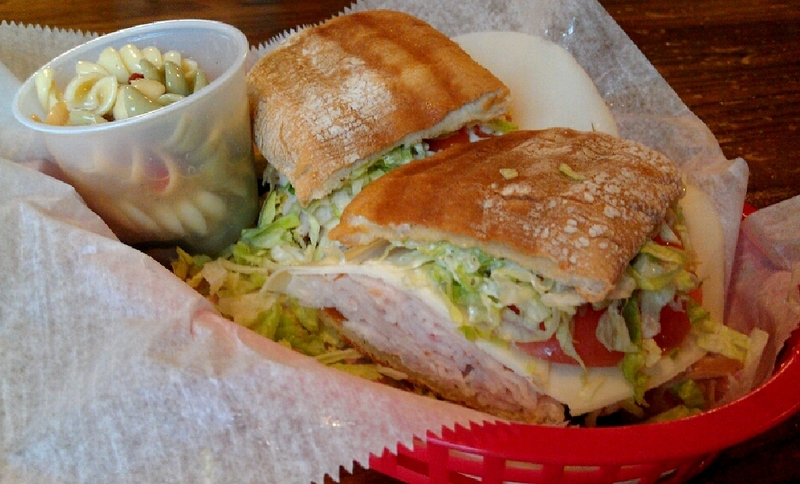 #15 Smoked Turkey Pesto – Smoked turkey, provolone, lettuce, tomato and pesto mayo on a ciabatta hoagie. Served warm! YUM! What a week! For the first time in 10 months…I boarded a plane! Crazy, right? LOL. Yes, the work travel is back in full swing. Denver this week…Miami next…and San Fran a few weeks later. I hope Bella doesn’t forget what I look like. Actually, I think she and Dad are going to have a great time during my mini excursions. I’m not sure who will train who…but I’m guessing they are both in for a few surprises! Poor Ruby might have to keep them both in check. I feel very fortunate to say that I am not feeling anxious or sad about traveling again. Ryan is an awesome Dad and I really enjoy my work (most days). A few days here or there of traveling is good for all of us. When I called home from Denver this week, Ryan and Bella were out for Mexican. I can just picture it…Ryan with a lime margarita on the rocks and Bella with an tiny umbrella tied to her bottle. They are quite the pair. Ryan, thank you for taking good care of our little girl! If the jumpstart into travel wasn’t enough, I also attended my first Rodeo on Tuesday. Yeee-Hawww! Yes, Sir…our team-building activity included a National Western Stock Show. I have to be completely honest with you…it was NOT my thing. I will save my opinions for another forum but I can assure you…I will not go back. My heart goes out to the animals. That said, it certainly was an experience. From now on, I can use the phrase, “Look, this isn’t my first rodeo!”…and I won’t be lying! Assuming fighting bulls and bucking horses isn’t your thing either, let’s get back to food! 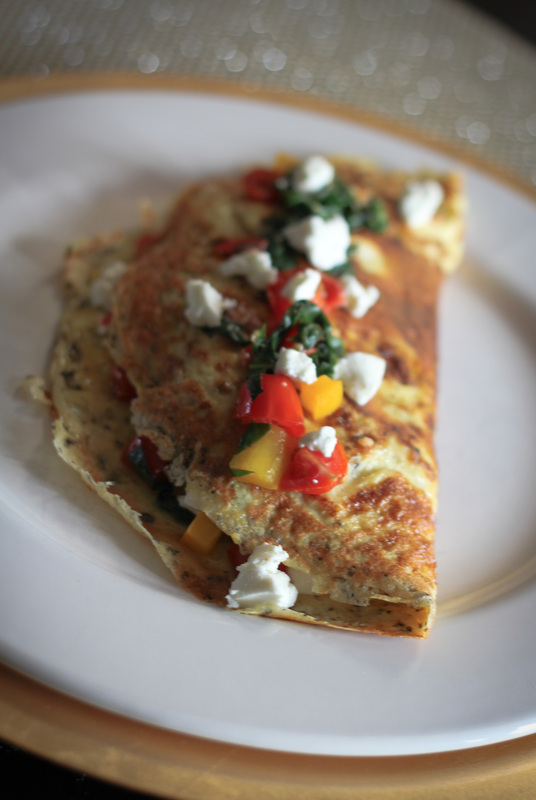 Today I have another Boudreau household favorite for you…Spinach, Goat Cheese, and Pepper Omelets! Truth be told…I let Ryan take the reigns on this one. In a medium nonstick skillet with low, sloping sides, combine the olive oil and the garlic. Cook over low heat until the garlic begins to sizzle, about 1 minute. Add the spinach and peppers; cook 1 minute. Add the tomato and a pinch of salt and cook an additional 30 seconds. Transfer the mixture to a small bowl; set aside.In a medium bowl, whisk the egg and water, just until blended. Add salt and pepper to taste as well as a pinch of basil and a dash of oregano.Place the skillet, wiped clean, over medium heat 2 minutes. Add the butter, swirling it to coat the pan. When the butter stops sizzling, pour the egg mixture into the pan. Reduce the heat to low and cook until the bottom is set, about 10 seconds. Using a rubber spatula or a wooden spoon, pull the set eggs at the edges of the pan toward the center, allowing the unset eggs to run from the center to the sides. (Adjust the heat if necessary to prevent browning.) Continue to cook until a thin layer of unset egg is visible on top. The total cooking time should be less than 2 minutes.Remove the pan from the heat; spoon the spinach mixture across the middle third of the omelet (save some for garnish); sprinkle with the goat cheese. Using a spatula, fold the third of the omelet nearest the handle over the center third with the filling. Holding the handle, tilt the pan so that the omelet rolls out of it and onto a plate, seam side down. Top with remaining spinach, tomato, and pepper mixure. Sprinkle with goat cheese. 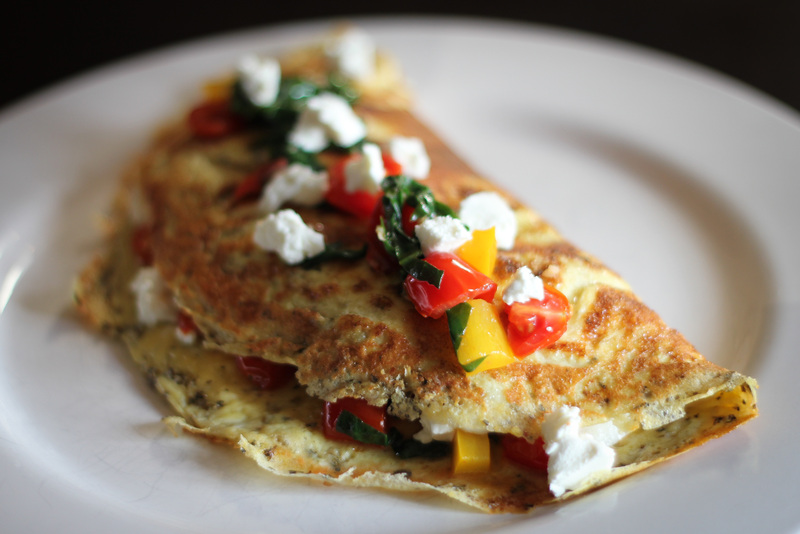 Over the last several months, we have come to love the ease of these tasty omelets. They make a great weekend breakfast…or a fast and easy weeknight dinner. Even better, whip up a batch for your next group of house guests…serve on a gold charger, sparkly placemat, and pair with a Mimosa! I’m Still Here…Chicken Soup & All! Friday January 13th…..where has the time gone?! The last time I wrote you was Oct 3rd and I was determined to post weekly. Little did I know that every minute I could spare after work I would soak up with Bella! She’s not your average little girl (ok, so I’m biased)…she is happy and sweet and an excellent sleeper! When I pick her up from daycare, I get at least 4 hours with her as she doesn’t “go to bed” until 10…and lucky for me, sleeps until we get her up in the morning! Sure, there may be a wimper here or there but quickly, she is back to sleep. Oh…God is good! While I SO loving being a Mom to Bella…I’ve still been cookin’ and thinkin’ about Indulge. Wednesday was a particularly “Indulgeful” day. First, my friend Katie mentioned the Turkey Burgers that I featured in my first year of Indulge. Later, I received a comment on my Red Wine Spritzers (Check it out. Lauren, I may not know you…but your comment cracked me up.). And finally, WordPress sent my blog 2011 recap. To my surprise, the day/post with the greatest number of “hits” was my last one…”Bittersweet Beginnings” on Oct 3rd. What are the odds? On the day of my last post…so many of you were there to check in. Thank you for reading! So…with all those little nudges…I knew it was time to get back to you. Thank you for your patience! Serve immediately while the soup is hot! I promise…it will hit the spot.